Today we welcome a new food columnist, Fran Hill, to the South Dakota Magazine site. You may remember her from our Mar/Apr 2010 issue. Fran's been sharing recipes and stories from her kitchen in Colome on her blog On My Plate since October of 2006. In her first column for us, she shares some of her leftover turkey secrets. With Thanksgiving comes turkey, and with turkey comes leftovers. It is only natural for my food thoughts to turn to turkey sandwiches. I love a mini turkey "slider" (although, truth be told, I was eating these long before "sliders" became popular and hit every trendy menu from here to eternity). King's Hawaiian Rolls are purchased just for sandwiches with leftover turkey. Dressing (yes, dressing with giblets, celery, and lots of sage) gets piled on with slices of turkey and big dollops of cranberry sauce. The sandwich gets tossed into the microwave just for a few seconds to heat the dressing, and I am almost in danger of throwing out my jaw in order to open my mouth wide enough for the first bite. It is pure post-Thanksgiving heaven for me. 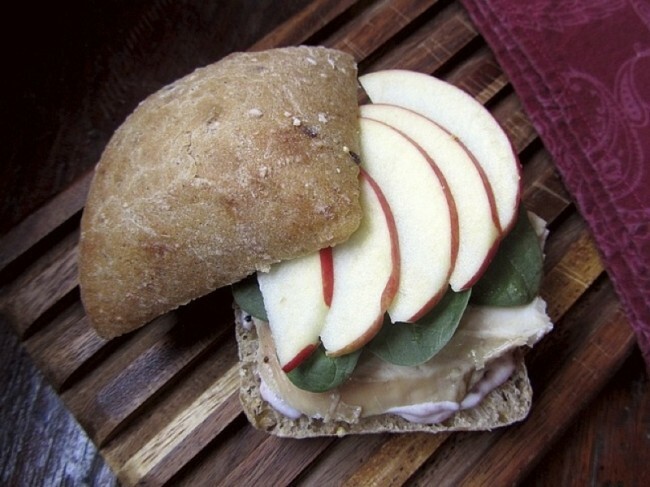 However, there are several other sandwiches that rank highly for the turkey that makes it past the Thanksgiving table. A Turkey and Apple Sandwich slathered with Cranberry Mayonnaise is awesome, too. I love the crunch that crisp, fall apples provide against the creamy tartness of the cranberry mayonnaise. Spinach is a nice addition, and thinly sliced red onion or even a slice of sharp cheddar are also great. What is going to be on YOUR turkey sandwich? Combine the mayonnaise, cranberry sauce and cayenne in a small bowl. Taste. Add a little salt, if you desire, or more cranberry sauce to up the pucker. Spread a portion of the Cranberry Mayonnaise on one slice of bread. Layer sliced turkey and your choice of fixings on the mayo-slathered bread. Top with the thinly sliced apple (and more mayo, if you desire). Crown each sandwich with another slice of bread. Enjoy. Looks delicious! I'm almost sorry we're having prime rib for Thanksgiving this year and will have no turkey leftovers. Almost. Wish I was going to Thanksgiving at your house. This looks really good. Thanks for your contributions to this online community of South Dakotans. I have been baking all afternoon, and nothing is coming together the way I want. I hope tomorrow's turkey goes better. Wishing to be here isn't such a great thing, right now. HaHa Happy Thanksgiving! Happy Thanksgiving Fran! That photo is gorgeous.